There is Jesus. And these 12 men – his disciples – which he has spent his earthly ministry pouring in to, teaching about the grace and true love of God, discipling them so that they can disciple others, preparing them for what is about to happen in just a few short hours. It’s their last night together, He knows He is leaving, they do not. He knows what is coming, they do not. Time is up. Time for final words, final instructions. And what does Jesus choose to give these men whom He loves so much? You see, Jesus knew what was up ahead and he knew it would be difficult for these men he loved so much, he knew they would be scared and he knew he wouldn’t be there to help them, so he wanted to give them his words that they could recall and be comforted. 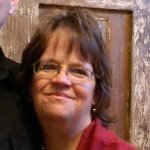 ​It was early, the sun wasn’t even up yet, and I was walking my youngest out to the car so we could go the hospital for her surgery. It was day surgery. A simple surgery. But it was my baby, and did I mention it was surgery. She was only seven and she sat there quiet, her eyes wide with anticipation. She was scared. I didn’t want her to be scared. I knew she was facing a scary unknown situation and I could not be there with her, but I didn’t want her to be scared. So I told and retold her what was going to happen and that it would be OK, in hopes that when it did actually happen, when she was alone, she would remember that momma said it would all be ok, and she would be not so scared. That was almost 20 years ago now, and over those 20 years I can recall so, so many times when this scene was repeated. Oh the circumstances were different, but the same sweet eyes were wide with anticipation… and just a bit scared of the unknown. ​Jesus knew what the next day would bring for his disciples, he knew what the next weeks and years would bring. He knew it would be scary, it would be hard, and that he would not physically be there with them. But he also knew in the end, it would all be ok. So he wanted to prepare them. I love that Jesus told them flat out that life was going to be difficult. “… you WILL have tribulation..” The realist. No sugar coating it, no might or maybe, no if or perhaps… you WILL have some hard times. Jesus could see the future, not just their future, but all the way to the end. He could see each of their lives from their first breath to their last, and he knew it would all be ok. It wouldn’t be easy, but it would be ok. It wouldn’t be comfortable, but it would be ok. The enemy that would be after them, engaging with them, being the catalyst behind their tribulation and hard times – was already defeated! This message is for us too. ​We are not promised a life of ease, a life full of big homes and shiny objects, a life of full bank accounts and careers with big titles. No, we are never told we will have prosperity. We are told we will have tribulation. When we do, Jesus is there. That enemy unleashing everything he’s got against you and your family, has already been defeated. "...for everyone born of God overcomes the world. This is the victory that has overcome the world, even our faith. Who is it that overcomes the world? Only the one who believes that Jesus is the Son of God." 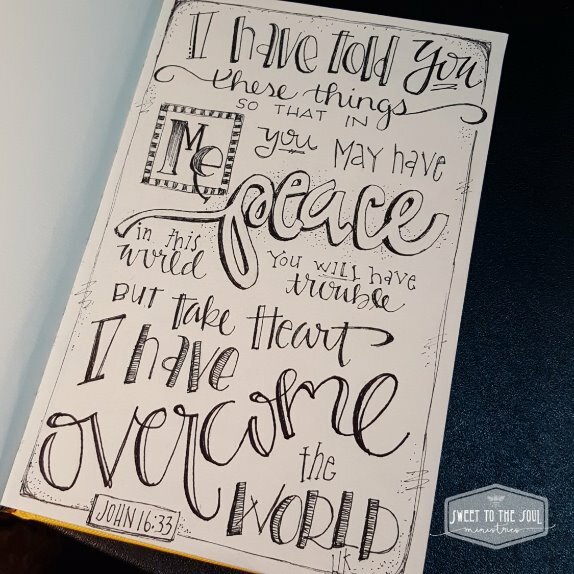 Today is the first day of the second round of #30DaysofBibleLettering. 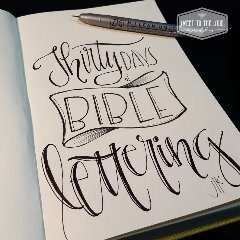 Find out more and get the scripture list at www.30daysofbiblelettering.com . Amen, Jana! I love this!